I broke my blogging log jam earlier this week with a bit of advice on How To Feed A Rabbit. As informative as that post was, I wanted to get back to something else I've been digging in to on this blog: exploring the innards of the Davis Weather Station console. There are a couple things that have been figured out since I last wrote about the thing, so let's fill in a few gaps. Some time ago, I opened the console up and worked out the pinout on the console's expansion connector. Remember this picture? Of course you do. That's easy, USART1 is used for the cabled version. Just look at the interrupt vector table, only the cabled firmware version has an interrupt vector for USART1. These things are obvious once you know the answer, I guess. The part is a Measurement Specialties 5534CM. Applications include "Weather control systems" according to its product page (man, I'd love to be able to control the weather). Here is its product page, here is where you can buy it, and here is some Arduino code to drive it! The cool thing about this part is that it has a digital interface rather than an analog one I had originally guessed at. It also is factory calibrated. Davis was smart and kept things simple: the amount of A/D they have to do in the console is exactly zero. But there seems to be a price to pay for this simplicity: $27.27 for a single piece, to be exact. Good thing they are cheaper by the 1,000. This all goes to show how good things can happen when you put some information out there. Other people either know something as well and are willing to share, or somebody sees something that you missed. I get a kick out of it every time a new piece of the puzzle gets put in place. Speaking of which, I put in an order to Mouser Electronics last night for a new Davis-related project. So hopefully there will be some good news to share in the next two or three weeks. I already have my blog post mostly written: I'm banking on success! I have a Davis VP2 and I'm looking forward to seeing it reversed engineered. I'm no where near qualified to do it myself. I'd like to take the data and send it to an Arduino (then to Pachube.com or something). My first choice would be to tap into the wireless from the weather station's transmitter and not even need a console. Second best would be to get the data from the console. Keep poking around this blog, and you'll find that both the comms interface and the datalogger interface have already been reverse engineered. You have your second best option available already. You'll obviously need more hardware than just an Arduino to tap in to the wireless interface. 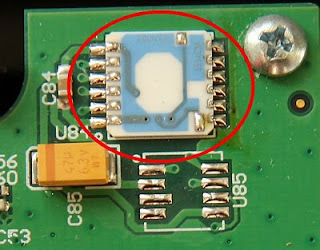 Can the MS5535C (or the MS5534CM you mention) be read from a standard digital pin on the Arduino? I'm using the serial pins 0 (Rx) and 1 (Tx) to drive a little OLED display, but I don't know enough yet to know whether the MS55XX series sensors can be read using the digital pins 2 to 13. Grateful for any advice :) I'll check back periodically for your response. Anonymous: I know squat about the Arduino. I suggest you post on an Arduino forum where someone more knowledgeable could help you. The link to the datasheet and the sample code should be all someone needs to answer your question.